On Jan. 23, 2009, while serving with the 1st Battalion, 3rd Marines, Corporal Travis Echols sustained a gunshot wound to his lower legs, instantly shattering the bones in both legs. His right leg was eventually amputated below the knee. 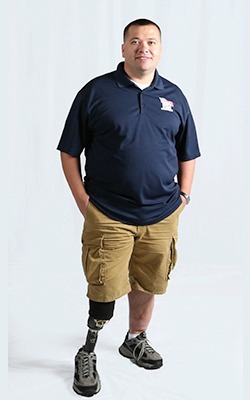 Travis underwent 35 surgeries within four years and spent eight months as an inpatient at various hospitals. He is now relatively mobile but prefers to use his wheelchair while at home for comfort and also to preserve the remaining function he has in his leg. However, his current living space is small and he has limited modifications for wheelchair access. A specially adapted, mortgage-free Homes For Our Troops home with an open floor plan and wider doorways will provide Travis with a safe and comfortable environment. Living mortgage-free will also relieve his financial worries and will help fortify a successful foundation for his future. In the years since his injury, Travis has become active within his community. He is a member of the DAV, VFW and America Legion, but his main interest is volunteering as an adult leader with the US Naval Sea Cadet Corps, a civilian youth organization. He has been involved with the organization for 20 years and provides leadership and mentorship to young people aged 11 through 18. Travis would like to eventually start a family of his own and says a specially adapted home will help him with that goal. Originally from Texas, Travis is planning to remain in the state to be close to family. Travis says it is impossible to fully express his gratitude to HFOT’s donors, sponsors, and supporters who will make his home a reality. “Their generosity makes it possible for disabled Veterans to live better lives.Their contributions are truly life-changing and make a difference that cannot be quantified,” he says.